Merrick Albright, a former military officer, is now a salty sheriff’s deputy who is frustrated and sickened by the current state of the United States and its ongoing political soap opera. He feels helpless to effect change on a national level and focuses on bettering his community by putting one bad guy behind bars at a time. After a series of coordinated nationwide terrorist attacks, the United States drifts into chaos. Police and other first responders scramble to keep control, but the divided and frustrated nation sinks lower as cities riot to the point that crime can’t be contained. What can Merrick do when law and order are a thing of the past? He must fight to keep those he cares about alive, but he cannot do it alone. Bryce Smith has served both as an enlisted soldier and as an officer in the United States Army, and he continues to protect and serve the rights and lives of those in his community as a police officer. 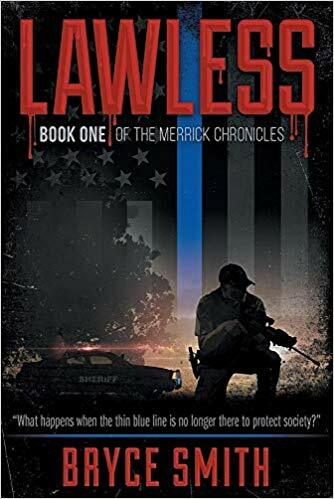 In his first book, Lawless, he uses his real-life experiences to bring a depth of character and interaction that comes only to those who have been in the trenches and who have had to cope with the aftermath of intense situations. He is passionate about the American Constitution and protecting individual rights, and for more than fifteen years, he has worked with people to help them become more self-reliant and prepared for the kind of crises he sees average citizens facing every day.